Just like a doughnut, yet with a different element. Thanks cronuts. 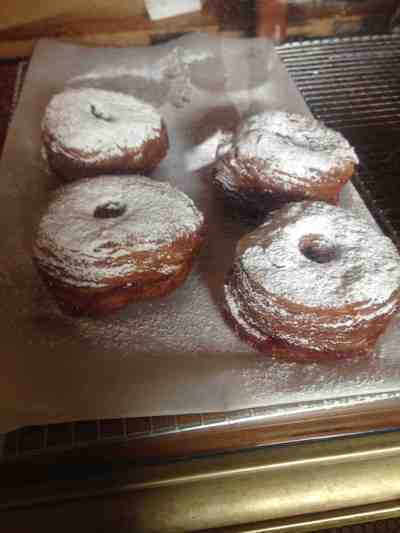 Yes Sydney, no doubt you've heard of "doughnuts" before, but what about a cronut. A crash course if needed...cronuts have started to become a top Sydney sweet sensation in cafes and bakeries alike. Therefore, where is the best cronut in Sydney? I am looking to learn some more about this intriguing sweet delight. Yes! I had a nibble of my friend's and it was to die for. Thanks Ally. If you agree, share your answer on this question for some karma points. There's a cafe in North Sydney Plaza that sells them. They don't make them on the premises. They're pretty good though. I'm looking around for others to compare.